​Estoban Corporation designs chimney cameras and air duct inspection systems. Our chimney inspection cameras and accessories are designed to operate in residential chimney flues sized from 3” vent pipe to 13”x18” fireplace flues. Larger size flues for commercial chimneys can be done with special packages to remotely control the cameras stability, tilt, rotate 360 degrees with cable lengths from 100-300 feet. ​Chim-Scan inspection systems are designed to produce HD quality imagery from inside the chimney structure, documenting the chimneys interior general condition or locate where defects may be hidden. Even with strong lights or sunshine, areas may be left unseen. Open voids within the chimney can drastically reduce its ability to operate properly, leaving condensates and by products escaping inside the chimney. These products can deteriorate the interior leading to costly repair. Therefore when using the Chim-Scan® inspection camera after chimney sweeping, the camera can provide verification that the chimney flue is free from soot and debris and assures the chimney is in operational readiness to vent the gases and soot properly. Beside fireplace chimneys the Chim-Scan® systems can also inspect masonry and prefabricated chimney flues also. They are used during chimney surveys when the Flue and Hearth Notes™ are used to gather data for Level 1 and Level II inspections. Chimneys designed to vent Oil, Gas, Wood, , Pellet or Corn burning appliances can be inspected using the Lighthouse camera, the smaller Enviro-flex chimney camera or the Combo Camera. Chim-Scan® chimney camera systems are used for recording the conditions of flues after natural disasters such as hurricanes, tornados, lightning strikes or earthquakes. 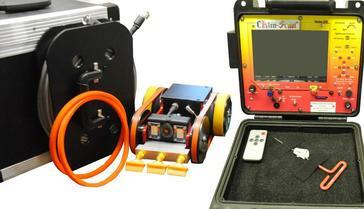 Chim-Scan® Robotic vision systems are used as an air duct camera system,including air duct robotic vehicle, used for inspections and can be set up with cleaning tools for residential and commercial air ducts. Chim-Scan® is THE chimney sweep camera of choice; since 1984 we have designed and built systems that have stood the test of time. Our cameras are used in various settings such as agriculture, including tractor mounts; historical canon camera and HVAC duct inspection cameras. We do all repair work on our systems, and some are 20 years old! We still have many parts and the know how to keep older system up and running, plus we can add new technologies to them when possible. A picture can say a thousand words, but the right picture taken in the right place can be worth thousands of dollars. When information is locked away in not so easy spaces such as chimneys, air ducts, or crawl spaces remote vision can offer a new level of understanding. Embracing new technology your customer can see with their eyes what it is you’re talking about? *Document conditions within a structure. Or check on the chimneys ability to contain the products of combustion, remote vision becomes a vital part toward NDT (Non Destructive Testing) goals.